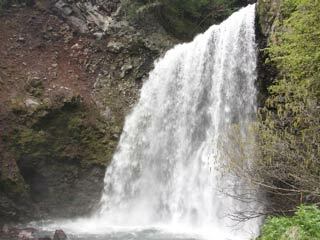 Zengoro Falls (善五郎の滝) is one of three major waterfalls of Mt. Norikura. It is 30m high and 10m wide. 1. use Norikurasancho Shuttle bus to Norikurakougen Onsen Skijo. It was named after Lumberjack Zengoro. When he was fishing at this fall, he captures great fish. However, the fish was too huge and it pulled him under the waterfalls. He survived and after that people started calling this waterfalls "Zengoro Falls."